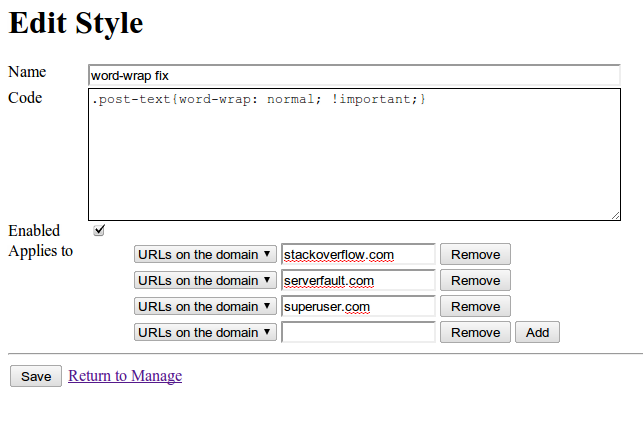 I made the word-wrap: break-word; style apply to the child <p> element of .post-text rather than the whole thing. I think word-wrap:break-word; in the .post-text class in http://sstatic.net/mso/all.css?v=6534 is to blame. I think the word-wrap:break-word; is not what we want there. Was it added recently? Well and good, but can we add word-wrap to the pre tags too? The following fixes the issue. Since I hadn't updated Chrome in at least a few days (lazy, you know), I am fairly sure I have seen horizontal scrolling instead of wrapping with 5.0.335.0. Not sure if it is related but suddenly today I am getting similar text wrapping in code blocks. I came to Meta to check if anyone else had seen the problem. I'm using Fluid Version 0.9.6. 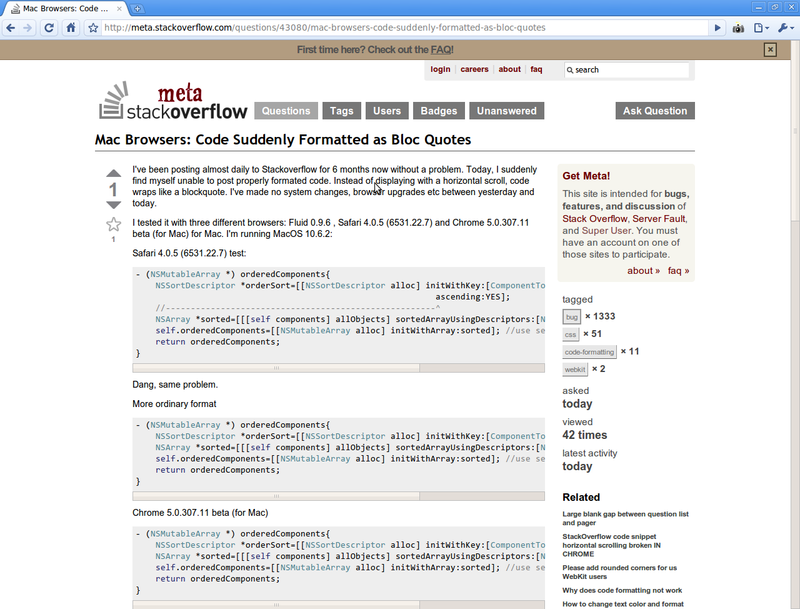 Fluid is a site specific browser generator based on Webkit/Safari. 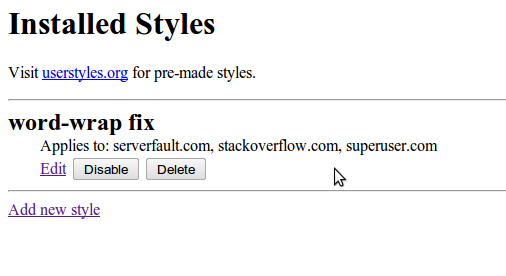 Ie used it to generate a SSB for StackOverflow and I have been using the resulting SSB for months now without issue. I am posting mostly Objective-C code. I've been posting just as I always have i.e. same formatting, same text editor etc but today suddenly I can't get code to format. It wan't to wrap the code like blockquoted text. For an example, see this post: iPhone: How to Embed NSData in XML for Upload to Server?. I gave up trying to post code in a couple of other post. I'll do some checking with all my browsers to see if its general. This seems to be a webkit related bug. Code block display on the iPhone has also suddenly changed... Anyone else seeing this? There hasn't been any software update to cause this, so is it an intentional change? Not the answer you're looking for? Browse other questions tagged bug status-completed design code-formatting webkit . Why is mini-markdown working in some of my comments, but broken in others? Can we have a “format code” button in the mobile theme?